6'L x 12'W. Inlaid white lines. Available in green or red clay. Indoor/outdoor use. 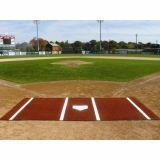 Spike-resistant artificial turf with throw down home plate. Thick foam backing. 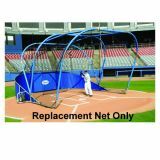 Add diagonal braces to the end frames of your wicket style tunnel frame. 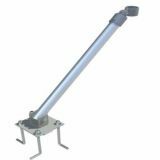 Provides added support to prevent end frames from bowing in due to cable tension. 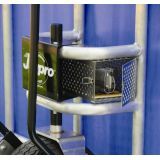 Includes 4 braces, fittings and attachment hardware for 2" O.D. pipe. Works with either semi-permanent or surface mounted installations. Artificial turf available by the roll. 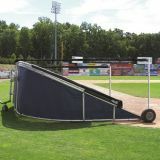 Used for batting cage floors, dugouts, baselines, bullpens, coaches boxes, walkways, etc. Excess turf may be trimmed in the field. All turf is green and sold by the square foot. Minimum roll length is 70'. 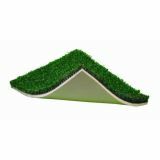 34 oz turf with 5 mm foam backing available in 12' wide rolls. This 6'H x 5'W heavy duty tarp is made of 40 oz. reinforced vinyl. Brass grommets along edges ensures a tight fit. Black vinyl with white strike zone. Includes two straps with clips to hang. Coaches storage bin with perforated aluminum and hinged cover. 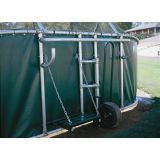 Attach to the Big League batting cage for storage of coaches keys, phone, etc. 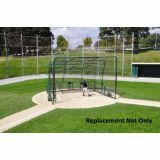 Now coaches can view batting practice from this convenient adjustable stand. 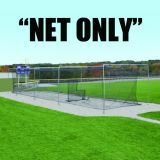 Black heavy duty #42 climatized nylon net. Size is 17' 6" W x 18' D x 12' H for units purchased prior to 2013. Please measure your cage to ensure proper size. 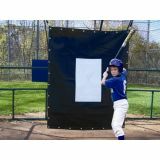 Optional vinyl skirt for batting cages. 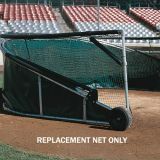 Heavy duty, #42 knotless nylon weather treated netting with rear baffle. Size is 16'6"W x 16'6"D x 12'H. Green heavy vinyl coated nylon skirt that protects the metal frame and gives the pitcher an attractive visual backstop. 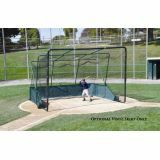 Fits cage 16'6"W x 16'6"D x 12'H.